Pine lumber off-cuts & common twine. 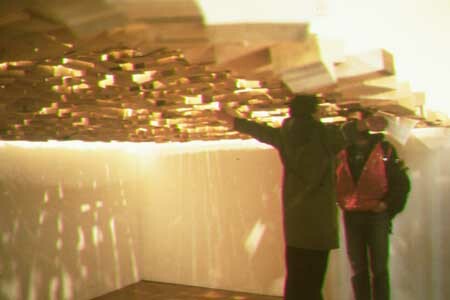 Kinetic installation invites viewer participation to create movement & sound. Blocks crash together and sounds move around the room, while shadows undulate across the walls and over the floor. This piece is a metaphor for an emotional outburst.